Fulltime RV Living, you gotta be kidding, there is not enough room on an RV for full time living. 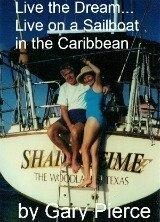 While living aboard a sailboat we came home for the summer, hurricane season. The first 2 years we traveled around by car but wanted an RV...we liked traveling. Moving to a RV from a boat means a big jump in space...remember on a boat the walls are not straight. We were grateful for the increased living area but realized a big space was not what made us happy. Less can be more, we were proving to ourselves that the more stuff you have the more it controls you. And it drains your budget. This site is all about frugal retirement living, not wasting money. the economy is in the tank and we are all forced to take a good look at how we can cut our spending. We have experience in living cheaply because we chose to live in smaller spaces...boat and RV vs a house...this shows you how little space you really need. We have been brainwashed by advertisers into thinking we need a lot of stuff...he who dies with the most toys wins... this is not the mindset for one who practices frugal retirement living. 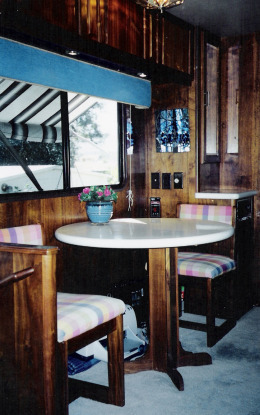 Here is a cozy table for 2, inside our 1992 RV...just like home...but home has room for 12...how many times do you need more than a table for 2? This is fulltime rv living, using only what you really need. Really, you can only use one room at a time in a house. How many days or weeks has it been since you have gone into the spare bedroom? When was the last time you used the formal dining room, the china and the formal living room? These rooms all take up space and cost a lot of money to maintain. What if you didn't have all that stuff...even better yet, think of what you could do if you sold your house, maybe the stuff in it and took off in an RV. If living in an RV is a new concept go visit a few campgrounds in your area. Notice that you will see a lot of people outside their RV's (RV means for our purpose, a motor home, camper, fifth wheel, any rolling home). You tend to spend a lot of time outside when camping, so that's space you don't have to pay for. It makes it easier to visit with other campers as well. When you entertain you tend to do it outside, using the benches that the park provides... Unless it's raining there's no need to go inside. That's why a table for two, a maximum of four, is all you need in your RV. By cell phone of course. More and more people are ditching their land line for the mobility of a cell phone. This is a savings you may feel like you are forced to make, but it almost always will be cheaper than a land line. It is also very easy to turn off. There is a time, about 7PM, when I don't need to talk to anyone...it can wait until tomorrow. Try it you will like it. If your signal is strong you can also connect to the internet with a phone access card that plugs into the side of your computer. Satellite TV this also a big favorite on the road. Walk down a row of RVs just after dark and you will find the TV going in just about every RV. You don't need TV to RV but most people have it. One caveat, most RVers have satellite TV and it can take anywhere from a minute to up to an hour to find a good signal. Some of our favorite campgrounds had a lot of trees and sometimes finding a clear line of sight would be a chore. If you are going to be there for a while you do what it takes to get set up. Fulltime RV living is not living cheap it's living cheaply! When you are on a long trip you won't want to go through the hassle this involves. You look in your campground guide for a park where you will be stopping that has cable TV and a pull thru. No unhooking your tow car and it only takes a few seconds to hook up shore power and the cable connection. Fulltime RV living... how do you get your mail? It is fairly simple to set up a mail forwarding arrangement with a Mailbox US, or some other chain you see in strip malls. These companies are set up to serve the one who wants to enjoy fulltime RV living. We didn't set foot in ours in Texas for the over 6 years when on the road and boat...it worked fine. When you are going to be somewhere for a while call them up have them ship the accumulated mail to you. And yes they will throw away the junk mail so you don't have to worry about paying to ship the latest invite to subscribe to magazines. Within reason you can also set up your residence in a state that may have certain advantages. See your tax adviser about this. How do you handle your affairs on the road? In the 10 years we were on the road we set up all of our bills to be paid automatically, either by credit card (we loved the frequent flier miles), or by automatic withdrawal from our checking. The credit card was paid automatically by the bank. This is not a big deal, we had zero problems. The first year we tried it we were a little apprehensive...more brainwashing...but it works fine. You may want to consider a banking relationship with a national bank with branches all over the country. Your life is simpler on the road than at "home" not only because of the great, fun lifestyle but you have less number of bills. Think about all the different ways being tied to a home pulls you. The plumber, the exterminator, the AC service, the phone company, power, water, sewer garbage pickup, etc...on the road you have some overlapping needs but not many. Try fulltime RV living. Life is a lot simpler on the road. How about health care if you are fulltime RV living? If you have pressing medical needs this will be something you need to consider. We are/were fortunate to only need an annual physical and traveling fulltime in an RV gives you a lot of doctors to choose from. This was not a problem for us and hopefully for you.There is no substitute for good health. Choosing any of the frugal retirement living options we have experienced will require you to pay close attention to your health. You are not relieved of the necessity of regular exercise when you enjoy fulltime RV living. Since you do tend a lot of time outside a walk around the park is a great way to get exercise...that's if you don't stop too long to visit!! Take care of yourself...there is lots to see and do with fulltime RV living...you want to enjoy it without restrictions. Don't you get lonely when you RV fulltime? You will have as many companions on the road as you want. If you like to alone you can be alone. But if you want friends you can have all you want. Remember everyone is congratulating one another for being so smart and living the fulltime RV living lifestyle. People you run into RVing are tired of the rat race, tired of keeping up with the neighbors, and are determined to make the most of retirement...all by living cheaply on the road.